Floradix Vitamin-B-complex contains vitamins of the B-complex which are involved in a multitude of important metabolic processes in the body and contribute significantly to general health and wellbeing. 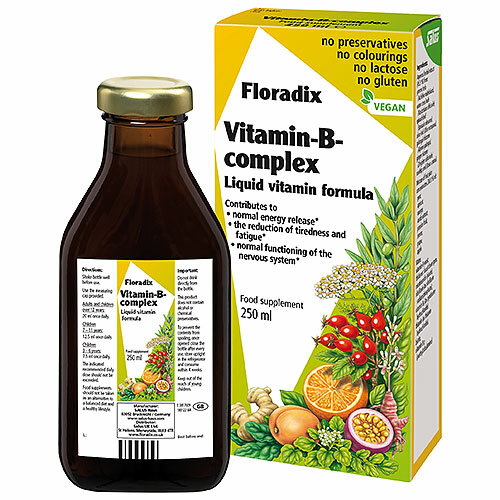 Floradix Vitamin-B-complex contains orange and passion fruit giving the product its fruity taste, making it a pleasant liquid alternative to conventional vitamin-B-complex tablets. 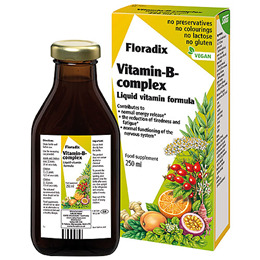 Floradix Vitamin-B-complex contains no alcohol, preservatives, colourings or artificial flavourings. It is free from lactose, yeast and gluten and is suitable for vegetarians and vegans. Aqueous herbal extract (45%) from: yarrow herb (archillea millefolium), water cress herb (nasturtium officinale), spinach leaf (spinacia oleracea), olive leaf (olea europaea), galangal rhizome (alpinia galanga), ginger rhizome (zingiber officinale), rosehip peel (rosa canina). Mixture of fruit juice concentrates (38%) of: pear, apricot, orange, carob extract, passion fruit, lemon, grape, apple. Water, thickener: locust bean gum, nicotinamide (niacin), riboflavin (as riboflavin sodium phosphate), vitamin B6 (as pyridoxibe hydrochloride), biotin, vitamin B12 (methylcobalamine), natural flavours. Adults and children over 12 years: 20ml once daily. Children 7-12 years: 10ml once daily. Children 3-6 years: 5ml once daily. The indicated dosage should not be exceeded. Shake well before use. Store unopened bottle in a cool, dry place. This product does not contain alcohol or chemical preservatives. To prevent the contents from spoiling, once opened close the bottle after every use, store upright in the refrigerator and consume within 4 weeks. Food supplements should not be taken as an alternative to a balanced diet and a healthy lifestyle. Below are reviews of Floradix Vitamin B Complex - 250ml by bodykind customers. If you have tried this product we'd love to hear what you think so please leave a review. I love this product the taste is gorgeous and there are no fillers in it. I buy it regularly.